Jesus' teenage years are missing. So are his twenty something years. In fact, there is absolutely no word in the Bible or any other text from the middle east of his whereabouts until the age thirty. There are documents in Tibet however and travelers have seen them. It's that simple. Yes, Jesus is the only begotten son of God but he is not the only son or daughter of God. The Bible used to say that until it was changed to "children of God." There is a path of mastery that needs to be walked. Jesus walked it. Did he ever! His training and mission took him to Persia, India and Tibet.We are intended to 'walk in his footsteps,' maybe not to those countries but we are supposed to become the master and 'put on the mind of Christ,' and 'do greater works than He,' as Jesus and the disciples admonished us to do. How do you do that? It's best to start early, with the best education from parents and institutions. If the parents have the awareness to tap into the esoteric mysteries of one or more of the major religions and transmit that to the child, then that will be of inestimable value down the road for the soul. What a blessing if the teenage years could be spent in pursuit of spiritual advancement. Jesus knew that. He went to India and Tibet to preach and continue his education. There were some things Joseph and Mary just weren't able to teach him, like advanced mantras and meditations using the third eye ('if thine eye be single then thy whole body be full of light.') and of course everybody's favorites, walking on water and rising up into the sky. All these things adepts in India and Tibet have been known to do. Where it might take a normal disciple years and maybe lifetimes to learn these "miracles," I'm sure Jesus learned them in record time. Calm down Christian fundamentalist person out there. I can feel a disturbance in the force. The path to mastery in all esoteric traditions involves the calming of the feeling world. You will be happy to learn that Jesus also preached to the Zoroastrians, the Jains and Hindus, probably even Buddhists too. He chastised the priests for keeping the sacred mysteries from their flock. He warned them of the perversions in the caste system and generally admonished people that the one God dwelt above and within. He taught Bhakti Yoga before he even knew what it was. (It is the path of Divine Love. Ramakrishna and Yogananda were exemplars of this path.) The Hindus knew this as they witnessed and felt the love flowing forth from his heart chakra. Above all else, Jesus teaches love and forgiveness, not a placid or meek love nor a sad love as depicted in many pictures; but a dynamic love, always proactive and vigilant. Many people have seen or have been told of the evidence in Tibetan books. Their stories are all documented in one book, The Lost Years of Jesus by Elizabeth Clare Prophet (including all of Notovitch's book). 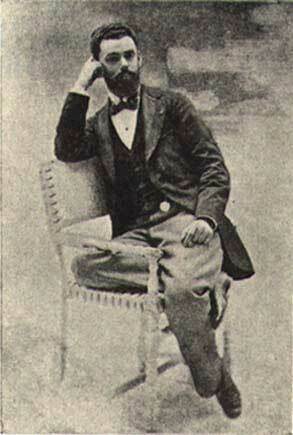 Nicholas Notovitch, the Russian gentleman below, was one of the first. "Where are these writings now to be found? And by whom were they originally written down?" I asked. "The Life of Saint Issa"
1. "In the course of his fourteenth year, the young Issa [Jesus], blessed of God, came on this side of Sind and established himself among the Aryas in the land of God. 2. "Fame spread the reputation of this marvelous child throughout the length of northern Sind, and when he crossed the country of the five rivers and the Rajputana, the devotees of the God Jaine prayed him to dwell among them. 3. "But he left the erring worshippers of Jaine and went to Juggernaut in the country of Orissa, where repose the mortal remains of Vyasa-Krishna and where the white priests of Brahma made him a joyous welcome. "It is not certain what route Jesus took on his journey to the East. 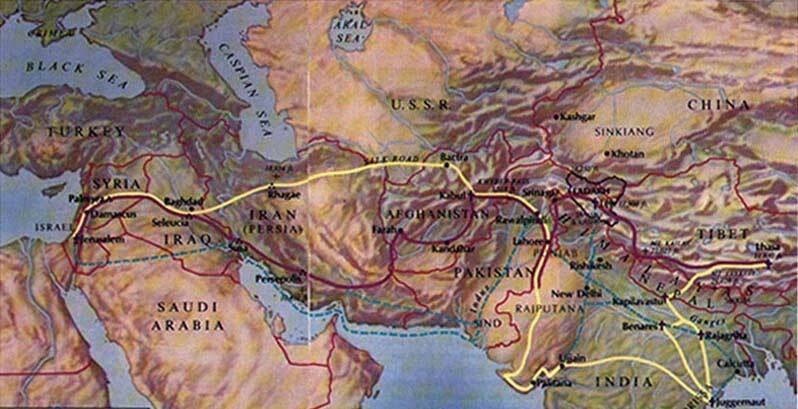 Here is one possible itinerary via ancient roads and trade routes, reconstructed from Notovich, Abhedananda, and Roerich texts and legends: Jesus departed Jerusalem (follow the yellow line), took the Silk Road to Bactra, headed south to Kabul, crossed the Punjab and proceeded to a Jain area on the Kathiawar peninsula where Jain temples were later built bear the town of Palitana. He crossed India to Juggernaut (Puri), made trips to Rajariha (Rajgir), Benares, and other holy cities and, fleeing his enemies went to Kapilavatsu--birthplace of Gautama Buddha. Jesus took a trail just west of Mt. Everest to Lhasa (where the palace of the Dalai Lama was built in the 17th century). On the return trip (follow the violet line), he took the caravan route to Leh, went south to the state of Rajputana and the north to Kabul. He proceeded on the southern trade route through Persia where Zoroastrian priests abandoned him to wild beasts. Jesus survived and arrived unharmed in Jerusalem." Map and text from The Lost Years of Jesus. Jesus, having immersed himself in Hinduism, began preaching to the lower castes about the inequities he saw and errors in doctrine that became distorted and diluted over time. The priest class (Brahmans) and the warriors (Kshatriyas) found out about it and plotted his death. 2. "But Issa, warned of his danger by the Sudras, left the neighborhood of Juggernaut by night, reached the mountain, and established himself in the country of Gautamides, the birthplace of the great Buddha Sakyamuni, in the midst of a people worshipping the one and sublime Brahma. 3. "After having perfected himself in the Pali language, the just Issa applied himself to the study of the sacred writings of Sutras. 4. "Six years after, Issa, whom the Buddha had elected to spread his holy word, had become a perfect expositor of the sacred writings." 12. "Enter into your temple, into your heart. Illumine it with good thoughts and the patience and immovable confidence which you should have in your Father. 13. "And your sacred vessels, they are your hands and your eyes. See and so that which is agreeable to God, for in doing good to your neighbor you accomplish a rite which embellishes the temple wherein dwells he who gave you life. 14. "For God has created you in his own likenessinnocent, with pure souls and hearts filled with goodness, destined not for the conception of evil schemes but made to be sanctuaries of love and justice. 15. "Wherefore I say unto to you, sully not your hearts, for the Supreme Being dwells therein eternally. 16. "If you wish to accomplish works marked with love or piety, do them with an open heart and let not your actions be governed by calculations or the hope of gain. 17. "For such actions would not help to your salvation, and you would fall into that state of moral degradation where theft, lying and murder pass for generous deeds." 13. "Earthly power is not of long duration, and it is subject to many changes. Of what use that man should revolt against it, seeing that one power always succeeds to another power? And thus it will come to pass until the extinction of humanity. 14. "Against, which, see you not that the mighty and the rich sow among the sons of Israel a spirit of rebellion against the eternal power of heaven?" ...18. "But having heard that my brethren were suffering still greater tortures, I have come back to the country where my parents dwell to remind my brothers of the faith of their forefathers, which teaches us patience on earth to obtain perfect and sublime happiness in heaven." ... 20. "... I have enjoined the purification of the heart from all blemish, for it is the true temple of God." 11. "She is the basis of all good and beautiful, as she is also the germ of life and death. On her depends the whole existence of man, for she is his natural and moral support. 12. She gives birth to you in the midst of suffering By the sweat of her brow she rears you, and until her death you cause her the gravest anxieties. Bless her and worship her, for she is your one friend, your one support on earth. 13. "Respect her, uphold her. In acting thus you will win her love and her heart. You will find favor in the sight of God and many sins shall be forgiven you." ...17. "Even as the God of armies separated of old the light from darkness and the land from the waters, woman possesses the divine faculty of separating in a man good intentions from evil thoughts." "Thus he returned to his homeland at the age of twenty-nine and began spreading the word of peace amongst his oppressed countrymen." "Why does one always place Issa in Egypt during the time of his absence from Palestine? His young years of course were passed in study The traces of his learning have naturally impressed themselves upon his later sermons. To what sources do these sermons lead? What is there in them of Egyptian? And why does one not see traces of Buddismof India? It is difficult to understand why the wandering of Issa by caravan path into India and into the region now occupied by Tibet, should be so vehemently denied." "Lamas know that Christ, passing through India and Tibet, turned not to the Brahmins and the Kshatriyas, but to the Sudras [lower caste]to the working and humbled ones. The writings of the lamas recall how Christ extolled womanthe Mother of the World. And lamas point out how Christ regarded the so-called miracles." 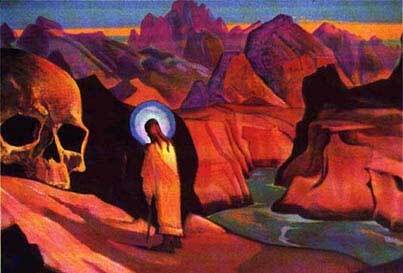 Roerich goes on to quote many passages that corroborate what Notovitch and Abhedananda saw as well as some marvelous incidents such as Jesus conversing with a Tibetan sage named Ming-ste and healing the sick in Ladak. Again, in 1938, another, Dr. Elisabeth Caspari, who studied under Maria Montessori and who only recently passed away in 2002, had the opportunity to see the evidence. Forced to stop in a monastery on their way to Himis, a chance meeting with the monastery's librarian took place. 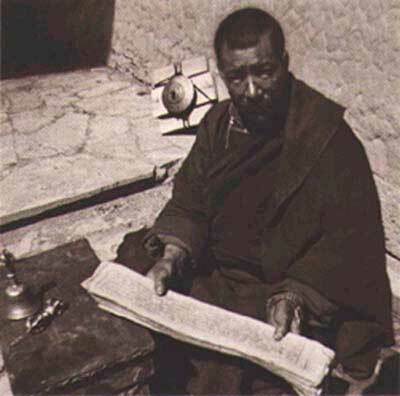 They snapped his picture as he told them that the loose leaf texts he held documented Jesus' travels in Tibet. "Shortly before the pilgrims departed, the librarian, carrying ancient manuscripts, approached Mrs. Gasque and Madame Caspari as they were seated on the roof: "These books say your Jesus was here." from The Lost Years of Jesus. ... Now, I want to tell you something in the beginning, lest there be any doubt in your minds: What I received from the Great Oriental Masters, that same have I received from the teachings of Jesus, the Christ! The Great Ones, like waves, bathe in the Eternal Sea, and become One with It. Disciples make all the trouble and differences. They begin to create narrowness and bigotry. The pure Message becomes diluted with ignorance. Humanity drinks of the polluted waters and then cannot understand why the thirst remains. Only pure waters can quench thirst. The time has come to separate truth from falsehood, knowledge from ignorance. All truth and knowledge must be sued to combat the black doubts and superstitions hedging humanity in the prison of unhappiness, that the mighty flood of Truth may inundate the gathered darkness of the ages, setting the soul of humanity free. It amuses me when I hear my Western brothers say"Do you believe in Christ?" I always say "Jesus Christ." And I picture Him in my mind as He really wasOriental Christ. Many painters have tried to give Him blue eyes and light hair, but He was a pure Oriental. And you of the West have taken from an enslaved nation, Jesus Christ as your Preceptor, and the greatest gift of allspiritual freedom, taught by this great Oriental. Every human being is a product of his climatic conditions, heredity, family characteristics, and the pre-natal and post-natal actions performed by him, as influenced by right or wrong will, right or wrong judgment, right or wrong habits, right or wrong feelings, and by the soul’s intuitive guidance. No matter what Jesus Christ was Himself, as regards His own Soulnone can deny that He, being born in the Orient, had to use the medium of Oriental civilization, customs, mannerisms, language, parables, etc., in spreading His message. Hence, the teachings of Jesus Christ, no matter how universal they may be, are saturated with the essence of Oriental civilization. Jesus was an Oriental, by birth and blood and training. The Wise-Men of the East, or East India, came to confer about Him when He was born, knowing Him to be one of the greatest message-bearers of Truth. I am not saying that Jesus Christ learned everything from the Great Masters of India, because God never teaches directly through human vehicles. But it has been definitely proven that Jesus was connected with the High Initiates and the Masters of India. In the "Unknown Life of Christ," by Nicholas Notovitch,the Russian author tells how he went to Tibet, hoping to study Tibetan literature, hand-written on papyrus scroll. Because of the secretiveness of the Lamas, it was impossible to find a trace of what he wanted; but a strange miracle happened. Just when he was returning fruitlessly to India, he fell from a cliff and broke his leg, and was taken back to the Monastery to receive the necessary care! The Tibetans are very hospitable to their invited or stricken guests. While the injured man was recovering, the head Lama asked him what he wanted. He said"Read to me the papyrus scrolls!" From these sacred scrolls, he secured conclusive evidence that Jesus Christs’s name was Isameaning Lord, which afterwards was pronounced as Jesus. He conferred with the Masters on Yoga and great problems of human upliftment, living with them at the Monastery; but at the age of fifteen, it is said, they tried to get Him married, so he fled. I don’t blame him. But, alas, those who do not marry, repent; and those who do marry, repent. That is why I am glad I am married to the Infinite Nature and Spirit. There is never any hurt and disappointment in that kind of marriage. Below is a fantastic picture from a Tibetan thangka. It is one scene of six. Here Jesus is with Tibetan monks in front of a Gompa or fortress monastery. 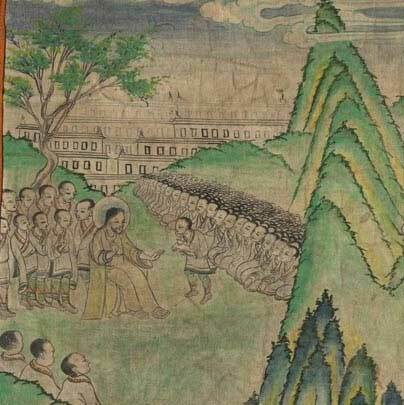 To see a larger image of this picture as well as two other scenes and to learn more about this extraordinary thangka, click here. What is the import of this information on Issa? And why is it opposed? Number one, just as Jesus found in India, there is a priest craft/class, in this case the Brahmins and Kshatriyas, that wish to hold on to power in every religion. They do not want us to know that the power and light is within us, if we just follow the path laid out by Buddha and Jesus (well, as we all know, it's not that simple). They keep the little people down by taking away the mysteries and distorting the truths laid out by the Prophets of God. By denying that Jesus traveled in India, the naysayer may be ultimately denying the Christ in you. That person believes that only one person can become the fullness of the Christ mind and the Buddha within. He could be denying the very teaching of Jesus himself and instead, chooses those Bible verses that are self serving and meant to keep the modern day Sudras in their place. As you can see even the great Master needed guidance and help. Oh what a blessing if only mothers, fathers and teachers today could realize they hold the destiny of civilization before them because the little child entrusted to their care has the potential to realize the Christ within. This is why the role of Mother and of education is always under attack. How great is the folly of taking God out of schools. It is rooted in atheism, couched in legalistic jargon that has nothing to do with the Constitution. It is the same old trick, keep the masses away from the God source. The path to salvation is a life long path. It is not easy and it certainly does not come by saying somebodies' name nor in sudden enlightenment. The earlier one starts the journey just as Issa did, the better for the soul. Here are some similar quotes from Jesus and Buddha, The Parallel Sayings. While not exact, I think they do show the commonality in these two founders and their religions. There is one God, one Truth and it is found in the esoteric understanding of core beliefs. The map and images are found in the Summit University Press 1984 trade size edition of The Lost Years of Jesus by Elizabeth Clare Prophet and are used by permission.